Cards, Wreaths, Ornaments, Trees, Figurines... How to Store Your Holiday "Stuff"
These tools can be used to store your holiday decor, gift wrap, trees, and all manner of cheer in your basement or attic. I have chosen products that fit my top storage requirements: space-saving, durable and budget-friendly. It's worth it to invest is high-quality storage products for holiday decorations because you'll be using them year-after-year for a lifetime. Storing your ornaments is a bit more time consuming than say, storing your socks, but with the right tools, you can be assured they'll stay safe over the warmer months. 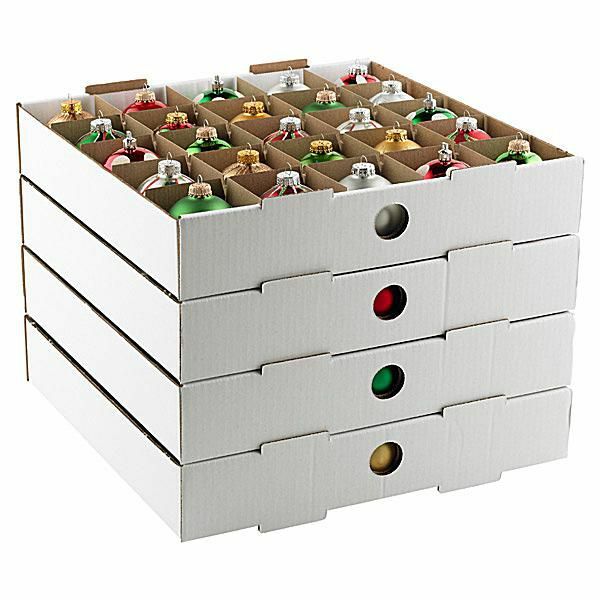 Wing-Lid Ornament Storage Box is classic and easy to use. Archival Ornament Storage means you can safely store ornaments (of the same shape) for several years in these boxes, and the corners are fitted with metal to make them extra sturdy. Raise your hand if you think this is the worst part of holiday storage. You're right! Luckily I discovered a simple solution: cord wraps. Cord wraps do exactly what they say they'll do, they allow you to wrap the lights around a specially-sized piece of plastic making the lights easier to store in a plastic bin, and--more importantly--easier to un-ravel next year. Check out these cord wraps. Bonus: they are super affordable. If you invested in a fake tree (they are pricey! ), make sure you store it properly to preserve its shape and look over the long haul. The best place to store the tree is in the basement, attic or even using overhead storage in your garage. Here are some options for what to store the tree in while it's not in use. Gift wrap is best stored together in a dry place (i.e., don't store it in the garage where it could get wet). I store gift wrap in a long plastic bin under the guest room bed. Wherever you decide to store it, make sure it's accessible for the holidays. Here are three ideas for how to store gift wrap. Continue to 5 of 11 below. No Santa hat necessary to store your wreath in this flexible holder: Wreath Chest 42" with Center Storage. This is so light-weight, anyone can retrieve your wreath from it's storage spot. A Wreath Storage Box, lacks the flexibility of a bag, and can be heavier, but it's much easier to stack. If it's a snow globe, take extra care and definitely wrap this in bubble wrap. Continue to 9 of 11 below. Gift tags, scissors, tape -- they all need a proper storage space, too. I recommend you store these with your gift wrap. In How to Organize Your Holiday Card Mailing, I recommend a few ways to store and edit your holiday card list. My favorite is Google Docs. You can create your own DIY holiday card/invite list in an excel spreadsheet and access it from any computer or device. If you prefer a handwritten list, I like the flexibility of note cards. In How to Store Everything in the Kitchen, I recommend two options for storing baking sheets and pans. For holiday baking, you will be storing more specialized items like cookie cutters, piping bags, and holiday-themed tins. For storing these items, I go back to my tried-and-true method of creating project bins. This way you can easily retrieve your holiday-themed bake-ware without it crowding out your everyday cooking supplies. And for small items like cookie cutters and decorations, I like these handled storage baskets.